You may think we are tooting our own horn a bit here, but the expertise we have in the business truly makes us the Top Industrial Cleaning Company in Los Angeles. 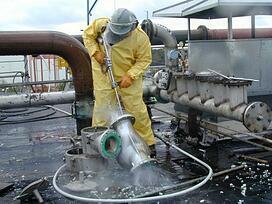 What is Considered Industrial Cleaning? Unless your employees are trained and certified in cleaning up any sort of hazardous waste spill or contamination, do not attempt to clean the spill yourself. Dangerous chemicals, such as corrosives, acids and flammables may be highly dangerous, and if handled by an untrained person, could result in serious injury or death! Solid oxidizers (e.g., permanganates, iodates, nitrates) mixed with combustible materials (e.g., paper, alcohols, other common solvents) may result in fire. Hydrides (e.g., sodium hydride) mixed with water may form flammable hydrogen gas. Phosphides (e.g., sodium phosphide) mixed with water may form highly toxic phosphine gas. Silver salts mixed with ammonia, in the presence of a strong base, may generate an explosively unstable solid. Having a trained and certified person or company handle the problem for you is extremely important. Can You Identify the Hazardous Waste? Do you know exactly what hazardous waste you are cleaning and the proper procedures for disposing of it? 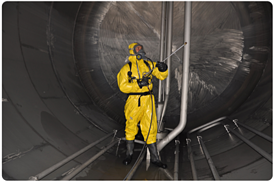 Protective Clothing – Do you have the proper clothing to protect the personnel cleaning the tanks? Minimize Costs – How much will it cost you in terms of time and labor to perform the work yourself? Down Time – How long will your facility or machinery be down due to the spill or contaminate and what are the associated costs of the down time? Residual Waste 1 – Just because you washed the tank with water or a compound mixture, how will you dispose of the residual waste? Residual Waste 2 - Will the residual waste be considered harmful or hazardous? Residual Waste 3 - How will you collect the residual waste? It sounds simple enough, but you would be surprised at how many companies try to save a buck or two and dispose of hazardous wastes by washing them down the drain or simply dumping them illegally. If you use certified trained professionals, the upfront costs will be mitigated by less down time, a safer work environment and legally disposing of your waste that will eliminate the possibility of law suits. Don’t take the risk, find a qualified industrial cleaning company, get a free quote from them, and do what’s right for your business and your employees.